Small Business Saturday begin their bus tour in Blackburn! Home Small Business Saturday begin their bus tour in Blackburn! Small Business Saturday UK rolled into town on Thursday as part of their Small Business Saturday bus tour. 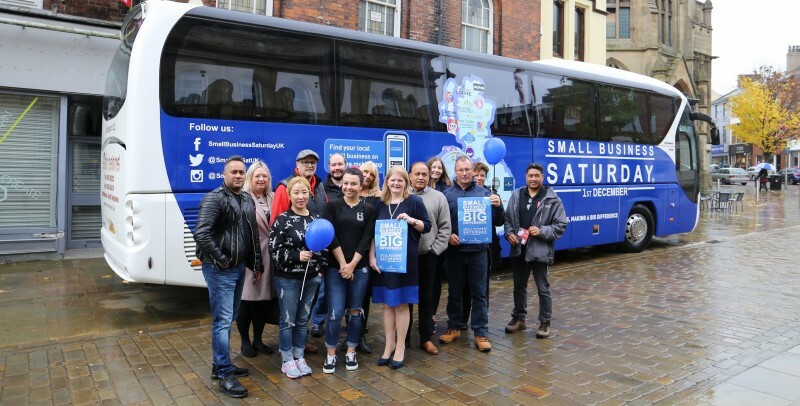 Blackburn is the first town to host the Small Business Saturday UK team before they call at 30 other towns and cities over the next five weeks, ahead of Small Business Saturday on Saturday 1st December 2018. Small Business Saturday UK is a grassroots, non-commercial campaign, which highlights small business success, encourages consumers to shop local and support small businesses in their communities. On Small Business Saturday, customers across the UK go out and support all small businesses whether they be online, in offices or in stores. Many small businesses take part in the day by hosting events and offering discounts. Small Business Saturday want all kinds of small businesses to get involved; whether you are a family business, local shop, online business, wholesaler, business service or small manufacturer, Small Business Saturday is supporting you! For all the ways you can get involved, click here. Are you a big business and interested in supporting Small Business Saturday? If so, please do get in touch.